As a glazing project manager, you always hope your projects go exactly as planned. Of course, this rarely happens. Sometimes there are hiccups or unforeseen obstacles, but you overcome them without too much trouble and it’s no big deal. But sometimes one error leads to another, which leads to another and the problems start to snowball out of control. This is the every project manager’s nightmare. It’s FAR more important to avoid this worst-case scenario than it is to get everything right. Small mistakes are no big deal – as long as you resolve them quickly. But when your project starts to look like Path 2 in the figure below, you’re in serious trouble. Paths 1 and 2 will get you to the same place. But Path 2 will take a lot longer and cost a lot more. Clearly Path 1 is the preferred path. 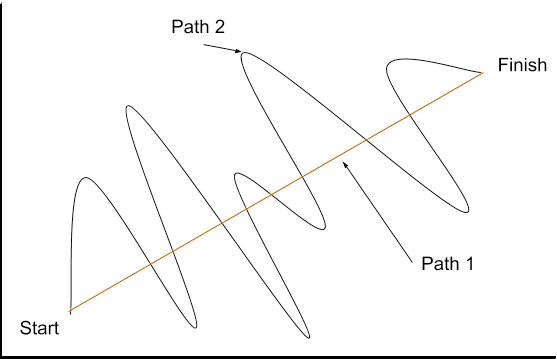 Let’s take a look at what these paths look like in practice and see if we can learn how to stay as close as possible to Path 1. When everything goes right, the project architect submits drawings and detailed specifications that are clear, concise, and detailed, providing all the information required to properly prepare shop drawings. In this scenario, you, the glazing project manager, gather all information your drafting team will need to start the project, including all parts and pieces to be used on the job, your company’s standard practices, desired system options, glazing types used, etc. Next, you review all specifications and contract documents to ensure all selected products fully confirm to the design requirements. Any deviations you discover are submitted through a formal Request for Information (RFI) to document changes and obtain the required approvals. Your drafting team then use this information to prepare shop drawings to the level of detail appropriate for the complexity of the project. You make sure they use a robust drawing review checklist before sending drawings back to you for review. Once you receive the drawings, you do another thorough review, checking all products shown, installation methods, sizes, quantities, finishes, etc. This double review process makes your life easier and improves the odds of catching any problems before the drawings are sent off for fabrication. Note: Refer to our Complete Shop Drawing Review Checklist for more information. After your thorough review, you send the drawings back to the drafting team to complete any required revisions. Once that’s done, you check them a final time and submit the drawings for final approval to the project architect. Because you conducted such a thorough review, the architect asks for very few (if any) revisions. Once the architect returns the drawings, it’s time to order materials and get the project moving along toward fabrication. You’re first in line for a raise and a big fat Christmas bonus! In this scenario, the architectural drawings shared with you are missing required information and critical dimensions. They’re not nearly detailed enough to send off to your drafting team. Because you’re on a tight timeline, you feel rushed and are forced to send only basic information to your drafting firm just to get them started on the project. You don’t get the chance to share your company’s standards for joint sizes, part specifications, desired flashing configurations, and more. The drafting team does their best with the limited information they have, using manufacturer standards for joint sizes and flashing details. Dimensions are scaled from the incomplete architectural drawings. The team ends up taking more time than planned to fill in the gaps and deal with missing information. You find yourself pressuring them to send you the drawings. And as a result, they don’t have time to conduct a thorough review. And naturally, you take some of this frustration out on the drafting team when you send the drawings back for serious revisions. You should have taken some time to cool off. Because in your frustration, you forgot to review the red lines yourself. Understandably, your drafting team is now frustrated with you for failing to provide adequate information the first time. Nevertheless, your drafting team persists and sends you the requested revisions as quickly as possible. Still stressed and under a time crunch, you assume the revisions are complete and send them back to the architect. Your blood pressure is now dangerously high. But instead of calling your doctor to schedule a physical, you pick up the phone and call your drafting team. “Can you guys handle these new revisions by the end of the day?”, you ask. “Not a chance” is the reply. The revisions add another week to your already inflated project timeline. After a week, the drawings come back. You send them to the architect and wait anxiously for a response. You sit down to order material and review the drawings closely for the first time. You notice several items that need to be revised before fabrication. You guessed it: back to your drafting team for another round of revisions. They inform you that you’ve used up all your revision time and will have to charge you extra. Now you’ve not only blown your schedule, but your project budget too. After another week with the drafting team, you get the drawings back. Finally, you’re able to order all the parts your need. Your glazing contractor gets to the field and realizes there are a few errors in the drawings. They find several cases of interference between glazing and structural components (you could have used 3D BIM to prevent this). You’ll need to spend more time and money to come up with workarounds and order new material to make the fixes. Have you started looking for a new job yet? As project manager, you can overcome bad or incomplete architectural drawings, project specifications, and tight timelines by staying on top of the drawing submission process from the very start of the project. Never move forward with shop drawings before you get precise specs from the project architect. You should also demand thorough and high-quality shop drawings from your drafting team from the very first submission. But you need to first provide them with all the information they need. They should never have to make assumptions. And they should be upfront about drawing lead times so you can plan accordingly. Next, you need to thoroughly review shop drawings yourself BEFORE sending them back to the architect for approval. We created a handy checklist to help you with this review process. Be proactive if there’s any information missing from the contract documents or drawings. Everybody needs to be on the same page before moving to the next step. Follow these best practices and your project will look a lot more like Path 1 than Path 2. You’ll save a bundle of time and money, and you’ll foster positive working relationships with your contractors, which will help immensely for your next project. Best of all, you might even get to keep your job! Respond in the comment section below or feel free to send me an email. I’ll personally answer any questions you might have.